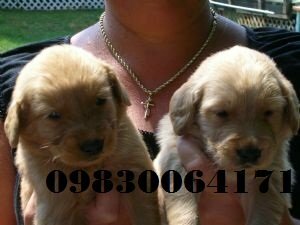 We Offer golden retreiver which come from champion bloodline and imported parents.We have both male and female puppies available.The Golden Retriever is very noble, self-confident, sensitive, intelligent, and adaptableGolden Retrievers are sturdy, strong, and kind, known for their adeptness at hunting and their strength of character. They get along especially well with children, with whom they are gentle and patient We take care of delivery for all over India. No transportation charges. Please call us on 9830064171 or email us at clawsnpawsplanet@gmail.com. Visit us at www.clawsnpawskennel.com.